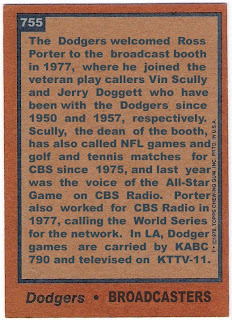 this is the penultimate card of my 1978 topps burger king dodgers/update project. we've covered the players that topps ignored (or showed with their new teams or as a part of a 4-player rookie card), and addressed the coaches, so now it's time for the broadcasters. 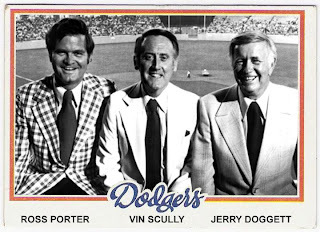 yes, i already did a card for vin scully, but i couldn't let this get done without recognizing ross porter and jerry doggett. 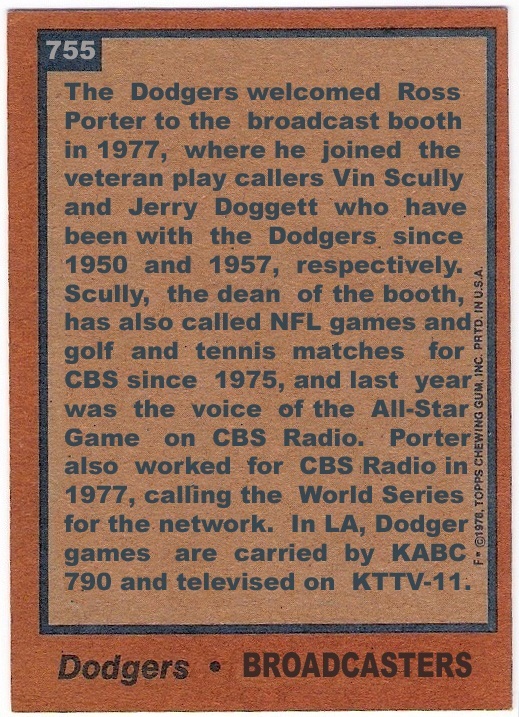 since i first followed the dodgers in 1977, i didn't realize that it was porter's first year with the team. he has a distinctive drawl, and i enjoyed listening to him although he got a little too deep into statistics sometimes. porter stayed with the team for 28 years, but was not renewed in 2004. instead, the dodgers brought on charley steiner (follow me to freedom!). 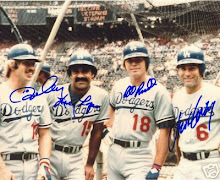 doggett, on the other hand, was with the dodgers for over 30 years, and left on his own terms. he retired after the 1987 season, and was replaced by don drysdale. doggett and scully formed the longest running broadcasting duo in the major leagues during their partnership. 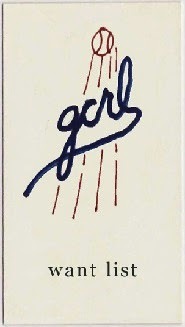 this type of card is not unprecendented. 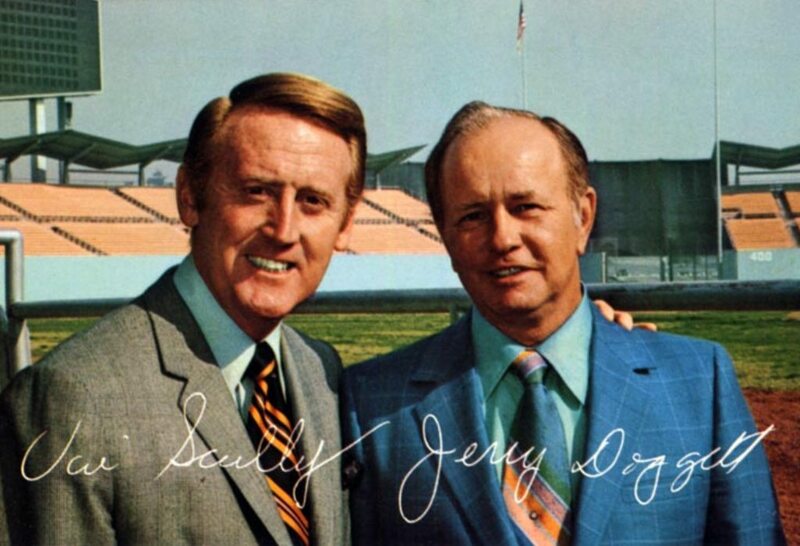 topps included ernie harwell (a former dodger broadcaster) in one of their fan favorites releases, and in 1971, a 'card' was produced as part of the ticketron dodgers release that featured the then duo of scully and doggett. here's to you, guys. 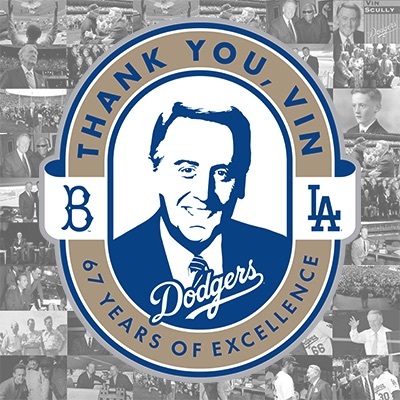 thanks for bringing the sounds of dodger baseball into my parents' transistor radio. and a pleasant good evening to you, wherever you may be.